Drew was born and raised in Beaufort, South Carolina, until he moved to Georgia where he graduated from Villa Rica High School. He joined the Air Force at the age of 18 and worked in the military police field, where he became a military K9 handler. He specialized in explosive detection. 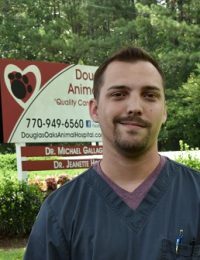 Through his handling experience he gained knowledge and experience in veterinary medicine which later led him to joining Douglas Oaks. Drew describes himself as “the best tech ever”.